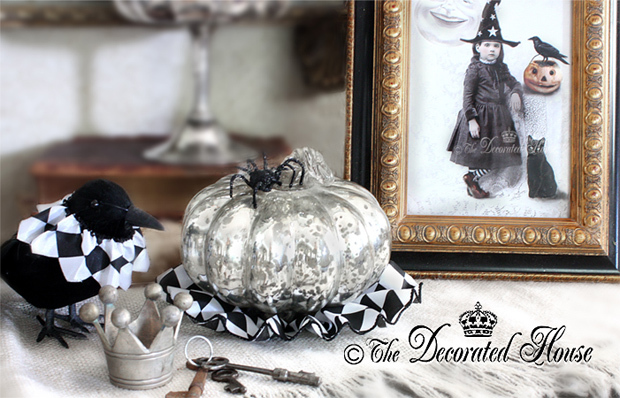 The Decorated House: October ~ October, the Halloween Month! October ~ October, the Halloween Month! It's October! A month that seems very special to a lot of people just because it means Fall is here for sure. The temperatures for us are actually going to be only in the 80's. Big Chill! I don't get in a big hurry for the really cold days, but the crisp Fall nights are a treat. So speaking of treats, it will soon be the big Trick or Treat day. You know how I love decorating for Halloween. It's time to find out what the crows and ravens did with their hats and collars, round up all the pumpkins and see which of the little witches and bunny goblins art prints will be a part of decorating this year. I think all the Halloween Art Prints are in the shop now. Will Cody Bear be in costume? I admire you for decorating for Halloween. Once my kids were past that stage I gave up!! I love to look at others though!! Hi Cindy! Oh Cody Bear loves Halloween! He spends it outside with Sweet Daughter and gets to see all the little goblins, and most of them want to pet him. He eats up all the attention. So nice to see you! Love it! Where did you get the tiny crown shown in the pic? Got a few of these mini crowns several years ago at an antique market. They are not antiques though. Thanks for stopping by. Enjoy your Halloween Holiday, dear friend!!! This is one Holiday "Mr. Ed" and I don't celebrate!!! The print of the child is adorable!!! Thank you Pat. I love bringing out my little vintage girls this time of year. Reminds me of the fun we had dressing up for Halloween each year. Thank you for coming by.